Paul Writer unveiled the Let’s Talk CX Fast100 through a Facebook Live. 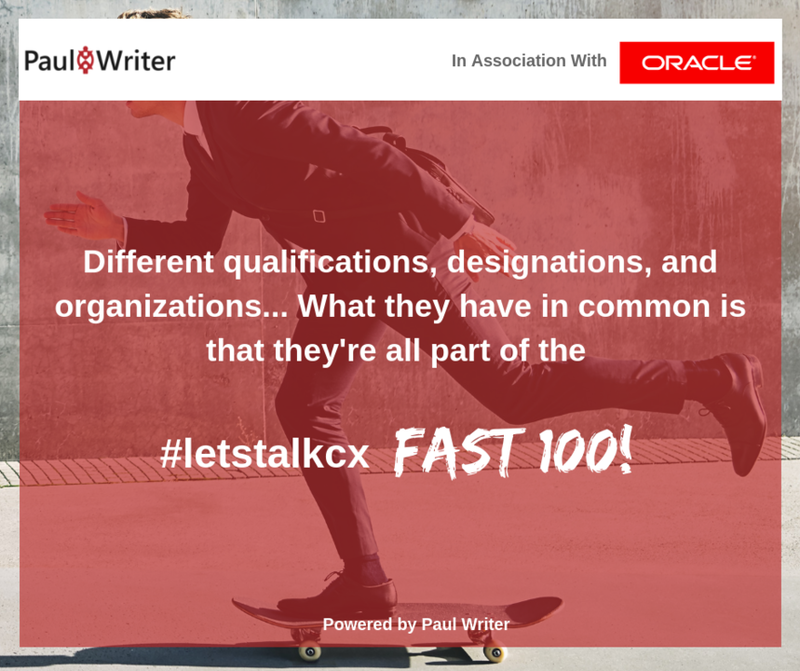 Let’s Talk CX FAST 100 recognizes the top 100 progressive Marketing, CX, Sales and Services leaders from mid markets who are writing new rules as being part of fast growing Indian organizations. The list is only open to home grown Indian brands with a revenue of less than INR 1000 crores. Paul Writer unveiled the Let’s Talk CX Fast100 through a Facebook Live. Our esteemed panel of jurors included Shruti Gupta, Chief Marketing Officer, Cashify, Shaakun Khanna, Head of Human Capital Management Applications, Asia Pacific, Oracle Corporation, Neha Gupta, Head of Marketing, Chai Point, Jessie Paul, CEO, Paul Writer, Deepak Tuli, Chief Business Officer – New Business, Makemytrip, and Amardeep Bajpai, Global Marketer and digital transformation specialist. Abhishek Joshi, Luxottica India Eyewear Pvt. Ltd.
Akhilesh Kumar Singh, ValueFirst Digital Media Pvt. Ltd.
Anshuman Verma, DHFL Pramerica Life Insurance Company Ltd.
Calvin John, OnMobile Global Ltd.
Dhananjay Chithathoor, LifeCell International Pvt. Ltd.
Diksha Pande, CoWrks Pvt. Ltd.
Gauri Awasthi, Fabindia Overseas Pvt. Ltd.
Himanil Bose, Shoptimize India Pvt. Ltd.
Jyotish Werulkar, QuickHeal Technologes Ltd.
Lancelot Dsouza, CouponDunia Media Pvt. Ltd.
Mandar Thosar, e-Zest Solutions Ltd.
Michael M.Bala, Softborne Technology Solutions Pvt. Ltd.
Mikhail Mitra, Mantra Labs Pvt. Ltd.
Munnish Puri, Swastik Productions Pvt. Ltd.
Sujit Paul, Mahindra Holidays and Resorts India Ltd.
Sumit Bedi, IndiaMART InterMESH Ltd.
Vishwalok Nath, TV Today Network Ltd.